The Maps Fold Out of These Books. 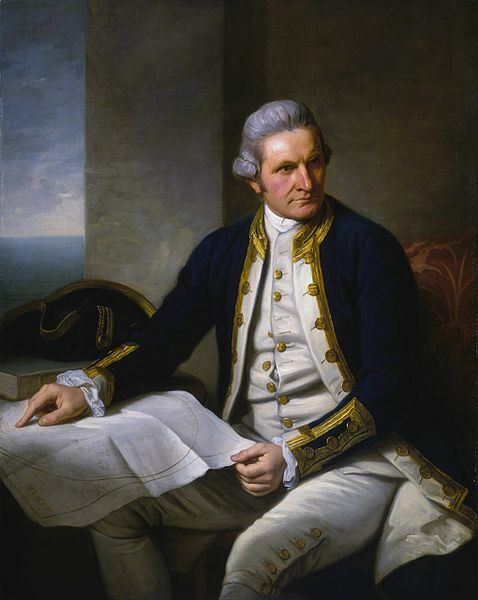 Portrait of Captain James Cook, painted by Nathaniel Dance (1775); wikimedia commons. 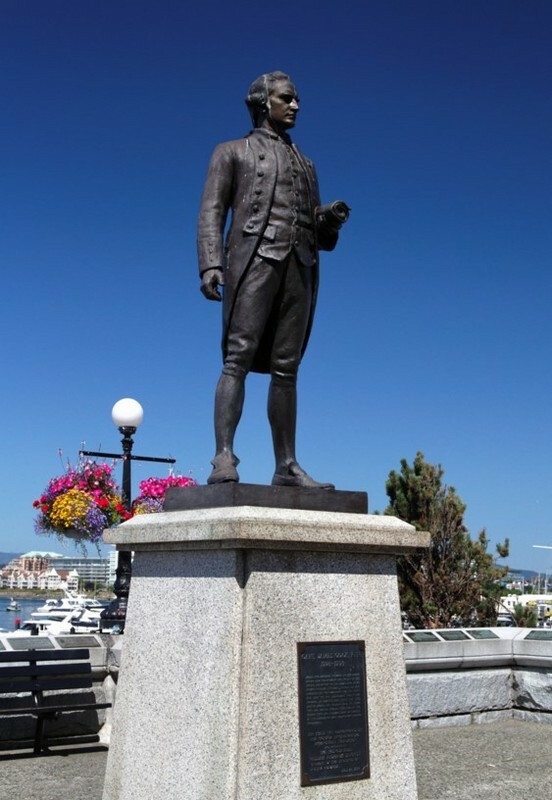 A Statue of James Cook Stands on Display in Victoria, even though he never came to the city. Global Conceptions: This is how the world looked in 1784. This map folds out of the book. Headline to the General Chart. Map's track shows the Southernmost point of the voyage: further South than anybody had ever been at the time. Mapping land is a colonial practice. For map expert John Short, maps are not representative of nature. Instead, he considers them to be “narratives with a purpose – stories with an agenda. They contain silences as well as articulations, secrets as well as knowledge, lies as well as truth. They are biased, partial, and selective” (Fotiadis, 2008, 4). With some consideration, it becomes clear that maps are overlaid with agenda. Cartographers would claim that maps are creating a useful tool for navigating the world in which we live, but a symptomatic reading suggests something more. Let’s consider the possibility that maps also serve to reinforce ideologies and ownership claims. One of the leading authorities on map making, Martin Dodge, engages in just such an examination of the process of map making. He argues against the idea that maps are neutral or objective, and promotes a claim that maps are about creating – not simply revealing – knowledge. The subjective part of the process includes factors like how the map might be coloured, where to add borders and boundaries, how it might look, what scale to use, and for what purpose that map was created. These decisions imbue maps with the values of those who construct them. They are undeniably reflections of the cultures of their conception (Dodge, 2011, 332). The ability to influence the decision-making procedure of a map’s underlying values and judgements signifies privilege – and privileged ways of knowing. Thus, for Dodge (and importantly to this discussion), “maps are the products of power and they produce power” (2011, 332). In this claim, the scientific essentialist view of maps as objective knowledge is called into question. We might be better served to view maps as socially constructed tools that are both useful for geographic location, and also expressions of power and knowledge (Dodge, 2011, 332). Knowing what we do now – that maps are representative of the culture in which they are made – we'll turn to an examination of the relationship between maps and colonization. Europe’s Enlightenment propelled the essentialist view that mapping was strictly a product of rationality to the forefront: so much so that maps became both the medium and the symbol of the spread of science and the empire throughout the world. The maps on display in this exhibit (and in question) will be the ones contained in Captain James Cook’s Voyages to the Pacific Ocean. The political philosophy of James Cook’s time period is a helpful setting off point for this exploration of mapping. The philosophy espoused by a culture is worth examining for two reasons. First, philosophy informs the shape of the culture, and it also reflects the values of the culture as a whole. The two philosophers that influence Cook’s Voyages most profoundly are Immanuel Kant and Georg Hegel. Their influence on Cook is outlined in an illuminating article by Mariano Siskind called “Captain Cook and the Discovery of Antarctica’s Modern Specificity: Toward a Critique of Globalization.” Siskind points out that Cook’s Voyages never would have become a reality without the zeitgeist of the age: namely the spread of reason by means of the empire. Contemporary to Cooks sailings, Immanuel Kant’s writing on universal history and perpetual peace gave some justification to encouraging the spread of reason. Hegel paired Kant’s writing about the spread of reason with the expansion of the state. Thus, the state expanding its territory is justified if (and only if) the state takes reason along too. Siskind writes that an analysis of Kant and Hegel is a necessary component of a larger analysis of colonialism because their writing was instrumental in transferring Enlightenment thinking from a conception of universalism in the world “to the politico-economical description of the universal expansion (material and territorial: global) of reason and its objectified detachments, namely, property rights and the State” (Siskind, 4). This situation is never seen clearer than in the case of Captain Cook. In fact, it was not even the state that sent Cook on his circumnavigations, but instead it was the most powerful scientific organization in England at the time – the Royal Society – that paid for his trips. Siskind describes the Royal Society as having “had been very self-conscious of the last frontiers left, and had been eager, in its world-historicity, to send out sails to conquer them” (Siskind, 11). This context was crucial for propelling Cook – a mathematician and astronomer – to become the most prolific naval explorer of all time. It is in the name of science and reason that he sets out, but during his navigations of the Pacific, “Cook becomes the embodiment of the globalization of reason, and on behalf of the rational state he discovers, names and incorporates lands into the British empire (Siskind, 16). Before we get to specifics let's consider two effective textual examples of the map’s role in the book. The first is the headline at the top of the general chart which reads: "A General Chart Exhibiting the DISCOVERIES made by Capt. JAMES COOK in this and his two preceding VOYAGES; with the TRACKS of the SHIPS under his Command." 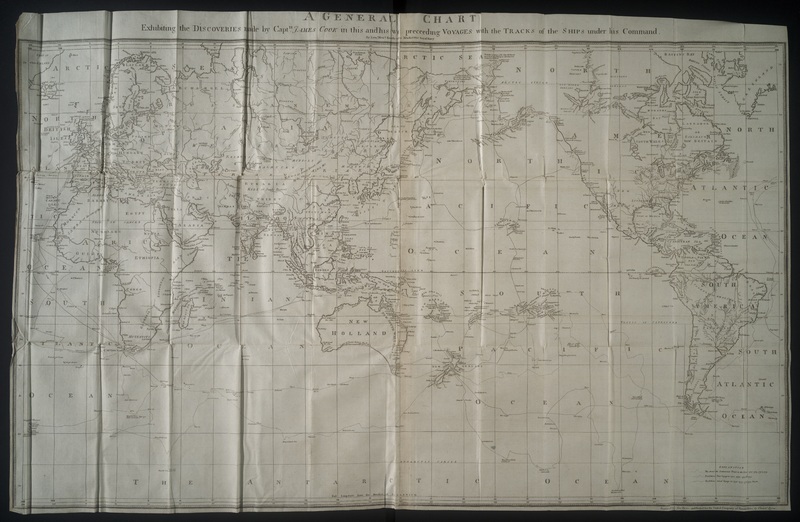 The map is used to "exhibit" the knowledge garnered by Cook's so called "discoveries" on his "voyages." That the principal map of the voyages is considered an exhibit of knowledge highlights the Kantian rationale that produced these maps. Another textual example worth consideration is the track showing the lowest point of longitude reached by Cook (although he attempted mores southerly excursions a few other times). The map overtly displays Cook's attempt to extend British control, and European rationality to the final frontiers in the world – pushing literally to the edge of the map. 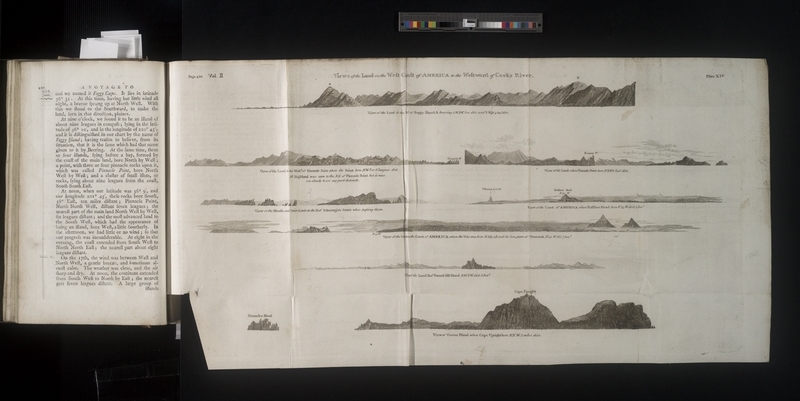 There are many ways that the maps in Voyages of the Pacific are metonymic of the rest of the book – that is to say, the maps that the book contains are representative for the book as a whole. And the book itself is a mouthpiece of its creators. Cook, of course, died on the third voyage. His death means that the authorship ascribed to him is a slight falsity on behalf of the publishers. Much of the book’s contents are pulled from his daily journals but they were assembled (along with the maps) by the British government to put Cook on a pedestal representing the spread of scientific rationality and British expansion (Barnett, xii). 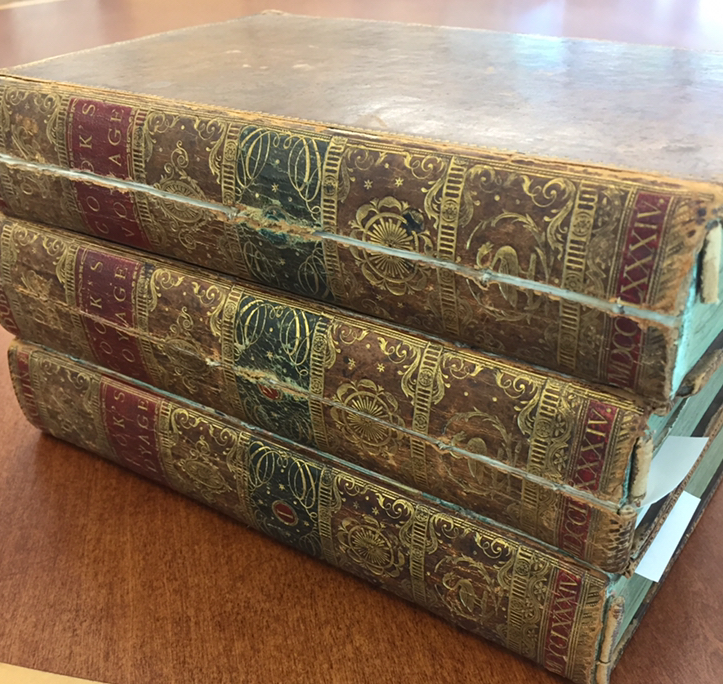 This project will highlight some of the ways that the maps contained in “Voyages to the Pacific Ocean” represent some of the dominant cultural principles of Britain in the late eighteenth century. The Nootka Sound area where Cook spent four weeks trading with the local population. General Chart Cropped to show Nootka Sound overlaid with King George Sound. Crop of the General Chart to show James Cook named Hawaii after the Earl of Sandwich. Seperate map of the Sandwich Islands (Hawaii). The purpose of the maps is evident in acknowledging which areas are mapped in Voyages of the Pacific Ocean. The places that are mapped with the most detail are the places that Cook deemed important. These places were decided upon because of the value of the trading economy that could be established, or the value of their location as a stop off for subsequent voyages. 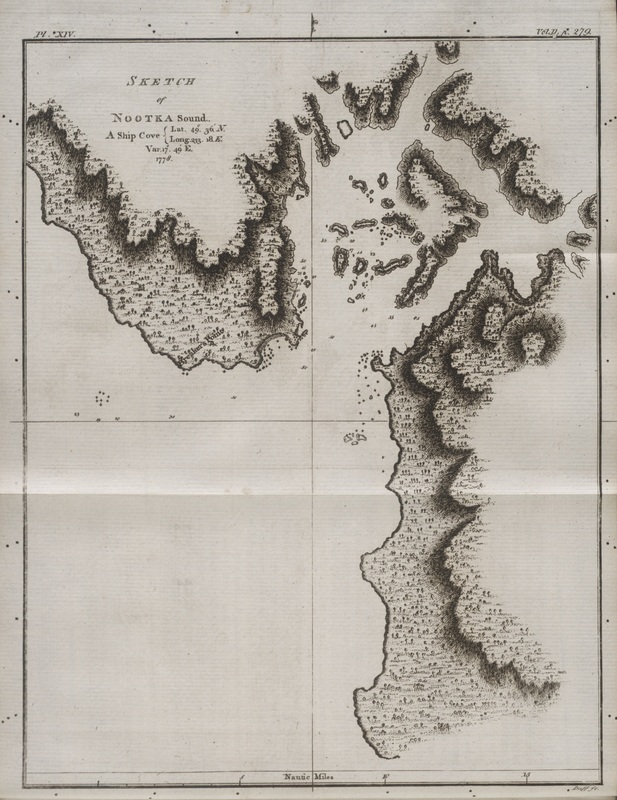 The detailed maps of Nootka Sound and Hawaii are good examples of both these traits. They are the places that Cook decided were central to the further spread of the British Empire. Indigenous scholar Charlotte Cote, writing about how colonialism interfered with indigenous ways of interacting with their environments explains that when Cook arrived in Nootka Sound, “Cook stayed in the area for a month, trading otter, beaver, and other furs with the Mowachaht haw’iih” (Cote, 42). A subsequent stop took Cook to China where he found that sea otter furs were in high demand. This knowledge, paired with his maps of the Nootka Sound area “set off a major otter-fur-trading market, center, attracting over fifty trading vessels from April to October for the next ten years” (Cote, 42-43). This example is a valuable resource to our case study because it exemplifies the way that maps act as a place holder for colonial intention. The more specific the map, the stronger the intention for future colonial action to that place. There is also a more overt way that Cook’s maps announced their claim of the land. Indigenous scholar Siomonn Pulla explains that, “A common cartographic expression of [colonial intention is] the deliberate acts of toponymic dispossession that rename and remap Indigenous territories and spaces in accordance with colonial traditions of geographical nomenclature” (Pulla, 290). Naming and renaming land was an integral part of colonial voyages, and Cook renamed locales extensively. 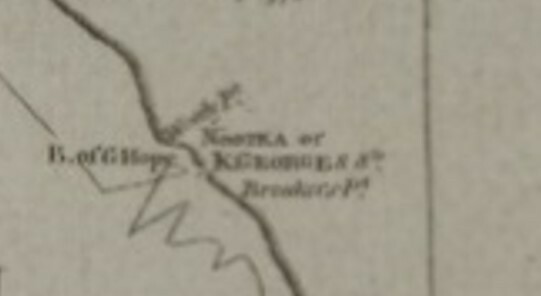 The given names are noticeable and on display on Cook’s maps. Hawaii was renamed Sandwich Isles after the head of the Admiralty in England. Nootka Sound was named King George Sound in reference to the King of England at the time. Even Nootka Sound is a name given by Cook. Author and maritime historian James Barnett recounts the oral history of the Mowachaht and Muchalaht people who resided in Nootka Sound before Cook arrived: when representatives from the indigenous population went out to meet Captain Cook and invite them into the village they shouted, "nu.tka. ?ičim, nu.tka. ?ičim, nu.tka. ?ičim, which translates into English as 'sail around.' Of course there was misunderstanding as the newcomers did not understand the Indigenous language. The words somehow became the word that was applied to us by outsiders, the Nootka" (Barnett, 132). In this, Cook misnamed Nootka Sound, and then later renamed it King George Sound. These layers of naming do not line up with the singularity that map making tends to promote, and in retrospect were a gesture to the power structure in England. After all, it takes authoritative power to name something. Including names on a map gives credibility to the namer, and it also serves as a distribution source for the new name. Names would become prolific because of their appearance on maps. Thus, maps were a crucial tool for the naming and renaming process that occurred under Cook’s command. Chart of the Northwest Coast of America and the Northeast Coast of Asia. Sketch of Mount Saint Elias. Crop of the Sketch to show Nootka Sound and Mount Saint Elias. There is another more overt way that maps helped support the colonial agenda. For the European explorers, when a country’s adventurers discovered a place, they also had a default privilege developing the area economically and socially. Because of the multiplicity of colonial powers developing ties in different places across the globe – ties with areas where Europeans had little connection – mapping became a way to prove their presence in faraway locations. If ownership of a certain area became questioned, maps could be used as a way to authenticate their presence in the place at an earlier date. Map making, in this light, is like taking the fingerprint of an area so that you can identify it later on; it became the ticket stub of the exploring endeavor – a proof of attendance. 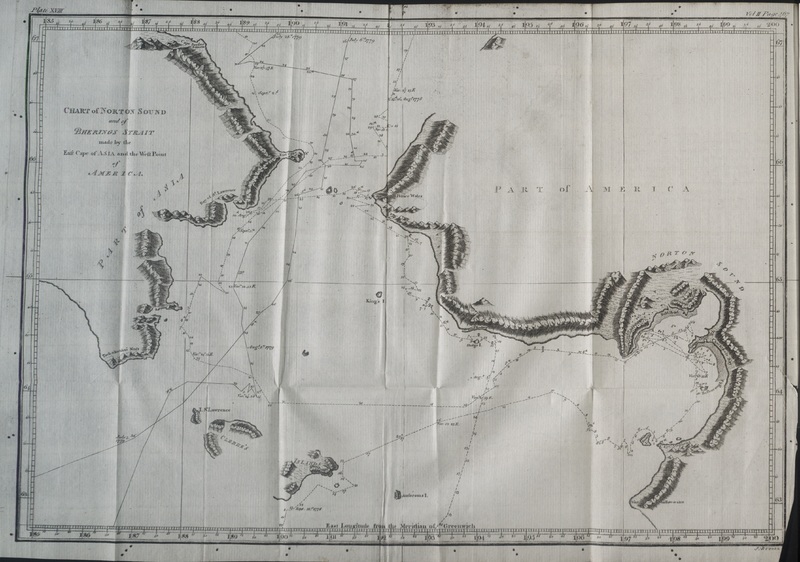 Thus, mapping became an important part of national land claiming for the European colonial powers. Where planting your flag would not suffice, mapping an area would prove your intention to return and develop it. Julie Cruikshank, in her now famous book on the Kluane National Park, gives us a helpful example of how map making was overtly used to claim land. Mount Saint Elias is the second tallest mountain in both Canada and the United States (the arbitrary border summits the mountain), so it stood out to the oceanic voyagers who passed by the area. Captain Cook sketched it because of its prominence, along with Mount Fairweather, the other mountain of noticeable prominence in the area. In this quotation, it is clear that mapping was used as a land claim. 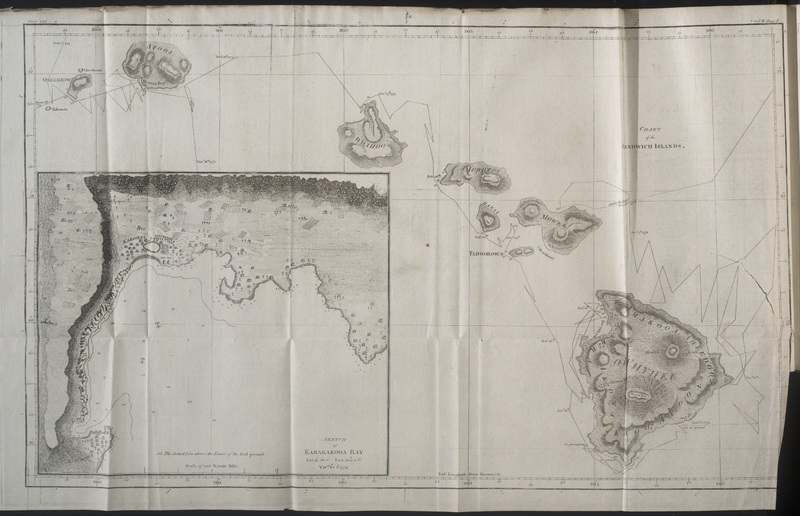 Land claiming by mapping places had already taken place by Cook, but because he missed a small piece in his charting, La Perouse was justified (through a colonial ethic) in claiming it as a national possession for the French colonizers. He was able to claim the land for France because Captain Cook did not map it precisely enough. That there were already hundreds of inhabitants in the area with a functional harbour and economy did not dissuade La Perouse. 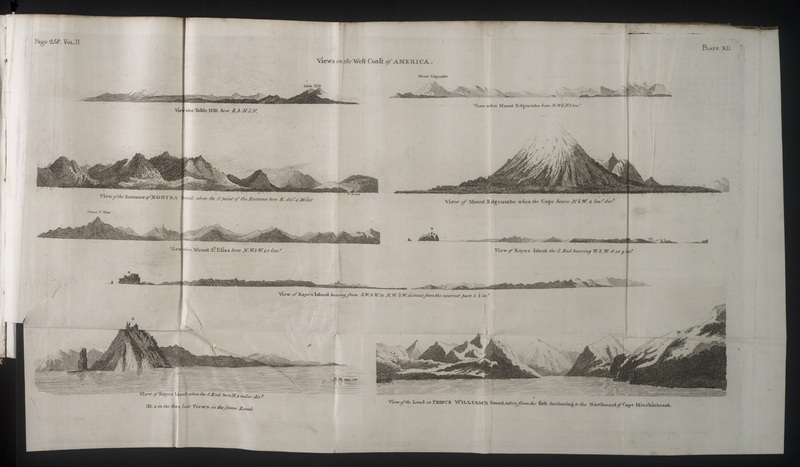 To remember our previous section on the practice of topographic renaming in cartography, both of these mountains were renamed arbitrarily: Mount Saint Elias because the explorers spotted the mountain on that Saints’ holy day, and Mount Fairweather simply to memorialize a sunny day in 1778 (Cruikshank, 2005, 14). The cartographers were so prolific in their naming that by the time they arrived in the North Pacific, they had named important places to the British Empire after important British citizens. The explorers resorted to naming some of the tallest mountains on the continent after the proverbial events of the morning. Cartography is recognized as a colonial action; and, by examining alternative mapping techniques, the difference is apparent. For example, consider the indigenous “lay of the land” mapping technique. Western-Canadian history scholar Heather Devine explains that “Western traditions of mapmaking are biased toward observing the world as a series of static points on a one-dimensional surface rather than capturing the motion-contingent perceptions of Indigenous travelers, who viewed their natural surroundings as holistic environments” (Devine, 3). Indigenous travelers used more dynamic navigational techniques. These techniques used more place based and experiential instruction to locate the dependent on his or her journey. As journeyers moved and interacted with the environment and landscape around them, their changing perspectives would serve as guideposts and landmarks. Devine uses the example of how “channel islands might appear to ‘move’ one way or the other” on approach (Devine, 2017, 3). She describes how “this approach to mapping does not “fix” the landscape on paper, but allows a traveler to move through it without necessarily staking claim to it as a place (Devine, 2017, 3). These are mapping techniques that hold less power over the landscape. Instead, a relationship with a dynamic landscape is built into the mapping process. The map-bearer does not own the land, but interacts with the land. 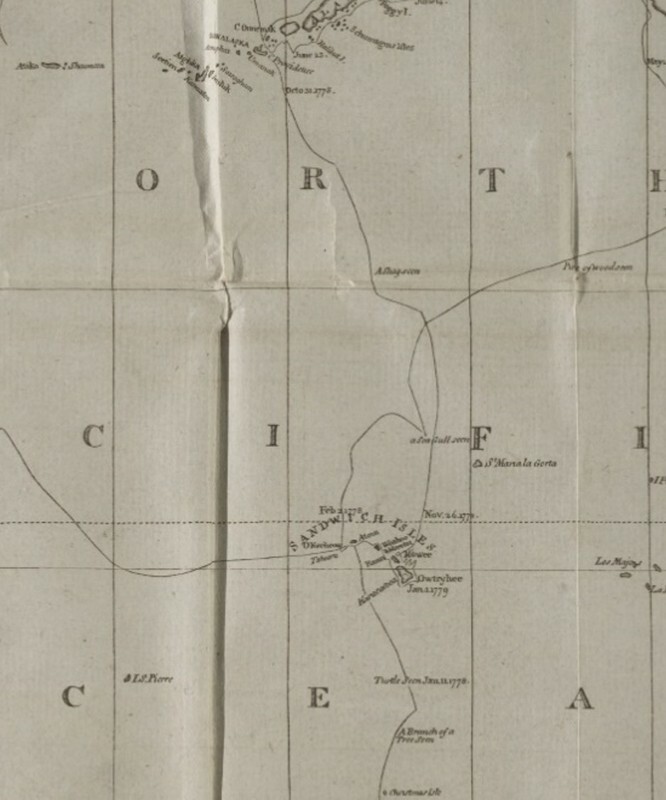 This elucidation of some indigenous mapping techniques shows how European cartographic practices expose the colonial desire for knowledge and power. Chart of Norton Sound and Bherinos Strait. Map Showing Blank Space in North America. Scan of how the Maps and Sketches fold out. Mapping was an exhibit of the spread of science and rationality to the British citizen. The maps that we are examining are contained in a very expensive set of books, so it is safe to say that they were targeting the powerful and elite in their messaging. This influence that maps exert over the people who are dictating the cultural conversations should not be overlooked, but the ability that maps have as a means of communication easily accessed by most of the population should also not be understated. 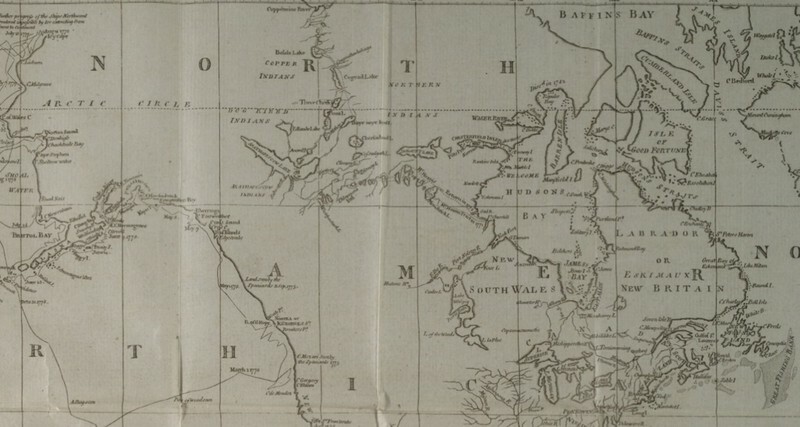 Captain Cook’s maps would have been prominent parts of the books and shown to children who couldn’t read – perhaps to spark an imagination of the conquer and exploration they could enact in later years. Old people who could not read for long durations could spend time pouring over these maps. In an age when illiteracy was still dominant, maps are an especially interesting communication medium to consider. Many of the people most influenced by colonialism were Britain’s lower classes who answered the call to a future life as colonists in the new world. 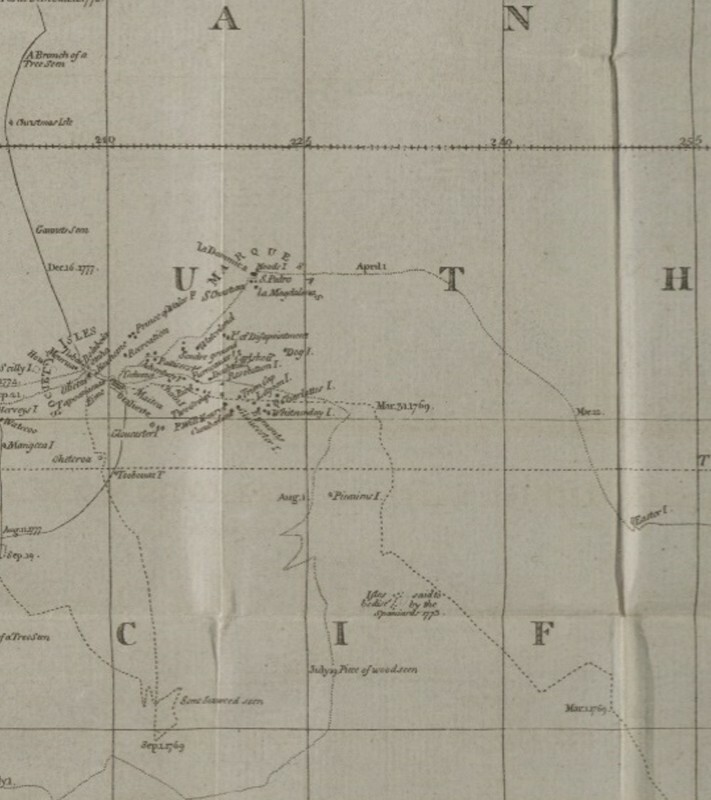 The idea of Terra Nullius (nobody’s land) was prominent at the time and can be seen depicted in the charts as empty space in parts of the map yet unexplored. On Cook’s central chart, the south coast of Australia and the North American West are examples of this empty space that needed completing by British political standards. The lines on the map that are used to track Captain Cook’s progress around the globe are especially good at inviting readers into the colonizing experience. These lines are called tracks. Complete with small notes of “vast fields of ice” or a “tree trunk seen” in the midst of the Pacific, tracks are a powerful invitation for the reader to insert themselves into the narrative that the maps provide. The date markings on the track provide a similar service. How could one not be struck by the ten days sailing across the Antarctic Ocean. What would those days have been like? How would the explorers have kept warm in those temperatures? How would they react not seeing any land for months? More than just inviting the eighteenth-century reader into the colonial narrative, interacting with the maps became a microcosm of the colonizing experience. Because readers had to unfold the maps from a book, they were actively, tactilely involved in the colonizing process. Their knowledge of the lands that Britain occupied became more apparent with every unfolding: sometimes as many as 36 “squares” of map had to be unfolded before the whole map was completely exposed. In this gesture, the handmade paper of the time becomes especially complicit with the colonial agenda as British citizens and future colonialists engaged with it as a means of co-exploring and thus co-colonizing alongside Cook. The tactile experience that paper provides is essential to developing this narrative of interacting with cartographic knowledge. Track depicting Cook's track running down latitude (approaching the island from the East). Track depicting Cook's track running down longitude (approaching the island from the North). Picture of a mariners clock, similar to the one Cook used for navigation and orientation. Because of his cartographic brilliance, his past mapping experience in Newfoundland and Eastern Canada, and his position within the British Navy, James Cook was the obvious appointment to be the leader of the excursions into the Pacific: He was the “one who could expand the sphere of British geographic knowledge and power” (Barnett, 2015, 5). Interestingly, mapping was not a primary reason for exploring the Pacific. 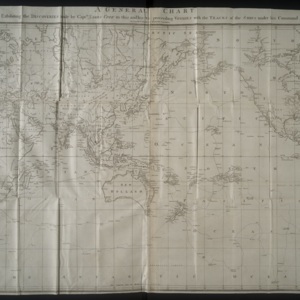 Barnett explains that the first voyage was initially and overtly organized by the Royal Society for the sake of demonstrating Britain’s status as a scientific power through active participation in the observation of the 1769 transit of Venus, an event that could not be viewed from Europe (Barnett, 5). It was only because the Earth’s orbit was ill timed that the Admiralty – at the request of the Royal Society – sent Cook to the Pacific at all. (Barnett, 5). The scientific aspect of the journey was central to the voyage so the maps that were created also pushed science to the forefront for the reader. The latitudinal and longitudinal lines overlaid on the map are a lens with which readers today are familiar, but the lines remain an effective and powerful means of dividing up the world into more manageable sections. As strange as it might seem, in the late eighteenth century these lines were cutting-edge knowledge. To the educated reader, the maps highlight them as symbols of progress and expansion. Latitude was relatively easy to discover. Simplified, the process was thus: a cartographer could measure and record the maximum height that the sun, or some select starts, reached in a day. That measurement could be cross referenced with some other recordings of specific latitudes. Because the earth spins on a tilted axis, some calculations had to be made, but all in all the calculations were within the reach of scientists in the 18th century. Longitude was much more difficult: so difficult that Queen Anne’s government offered a 20,000 pound reward for a solution to the “longitude problem” in 1714 (Andrews, 11). The problem was quite specific. The earth spins a full 360 degrees in 24 hours. Divided up, this is 15 degrees per hour. If cartographers in the Pacific knew the time in London, they could compare it to their local time, giving them a distance between the two locations. More importantly, it provided them their location within the grid of latitude and longitude. The eighteenth century had produced accurate and reliable clocks by the time of Cook’s voyages, but they all contained a pendulum in their function. These pendulum-dependent timepieces were not useful onboard a moving ship because the waves would disrupt the pendulum’s swing. Mathematician and cartographic historian Bruce Chandler explains that there were two possible solutions to the longitude problem. Either a mechanical clock – one that ran without the use of a pendulum – had to be developed, or time measurements would have to be calculated in reference to regular astronomical events. Eventually the orbit of the moons of Jupiter or the distance of the moon’s orbit from predetermined stars were successfully used. Chandler calls this eventual ability, “one of the great mathematical achievements of the eighteenth century” (Andrews, 34). For Cook, four minutes of difference in time meant a whole degree of change on the maps. Cook was not dealing with generalities, but specific calculations for which he needed extremely accurate time measurements. The astronomy approach had to wait until the middle of the eighteenth century before sufficiently accurate instruments and tables were ready for practical cartographic use (Andrews, 44), but the approach had problems with use in navigation. The rocking of the ship made telescope observations hard to make, and slightly cloudy days meant that cartographers couldn’t calculate their positions. Developments on the development of a sufficient marine timepiece had John Harrison, now famous in the cartographic world, qualify for the 20,000 pound reward with his fourth marine clock which was completed in 1759. 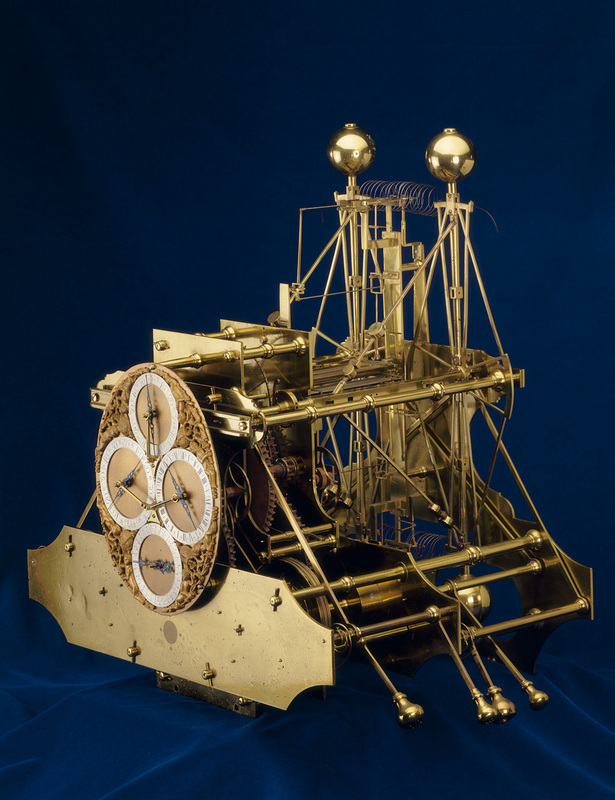 After a trial run at the Royal Observatory in Greenwich, Harrison’s clock was tried out at sea for the first time by Captain Cook during his second voyage (Andrews, 47). In the end, Cook’s voyages utilized both techniques. Principally, the mariner’s clock was used to determine location, but the clock would be reset whenever the cartographers could stop on shore and reference the celestial time-markers. Cook was the first to utilize the mariner’s clock as an accurate navigational technique at sea. He proved to the world that the mariner’s clock was an effective method for cartographic location. The confidence that this progress instilled in the advances provided by the scientific community was immense. Cook’s maps have the imprints of this scientific advance overlain on them. This evidence can be seen in more than just the latitude and longitude overlay. The tracks that Cook made in his earlier trips show the voyage approaching destinations primarily from the east or west. Travelling along lines of latitude was the easiest way to confidently arrive at your location when your longitudinal location was unknown. 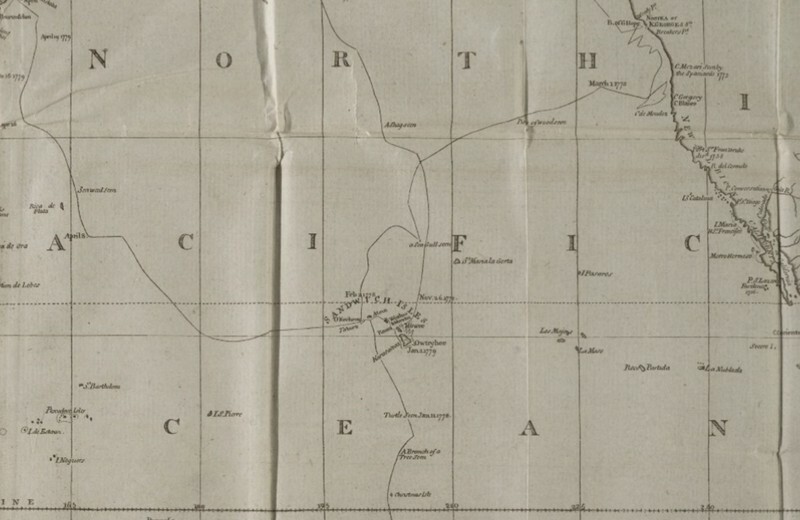 The tracks that depict Cook’s latter voyages reveal approaches to islands from the north or south – a display of the confidence that Cook and the British Empire held in the advances of the scientific community. Indeed, Cook’s maps show that the British were the first to solve the longitudinal problem. This is what the world "looked" like in 1784. This is a similar project that focusses on mapping and colonialism. Interestingly it is also curated by students (at Duke). This is an collection at the University of Victoria where early editions of local maps are held. If you are interested in early iterations of maps, please keep exploring! This is a department at the University of Victoria that examines the social repercussions of mapping practices and proposes new mapping frameworks that support indigenous land claims. Social cartography in action. And this is another Omeka exhibit from a colleague at the University of Victoria who examines the figure of Captain Cook from another angle. If you would like to curiously explore a cleaner version of Cook's central chart (shown to the left) click here. Andrewes, William J. H. The Quest for Longitude: the Proceedings of the Longitude Symposium, Harvard University, Cambridge, Massachussets, November 4-6, 1993. Collection of Historical Scientific Instruments, Harvard University, 1998. Barnett, James K., and David L. Nicandri. 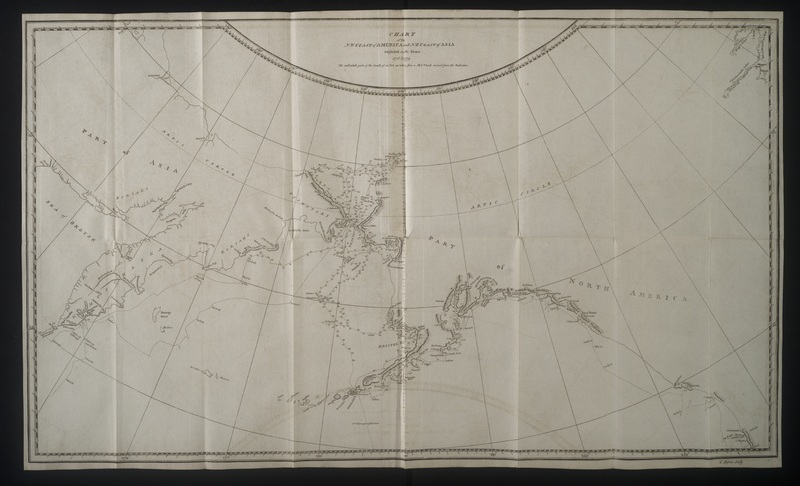 Arctic Ambitions: Captain Cook and the Northwest Passage. University of Washington Press, 2014. Colpitts, George, and Devine Heather, Editors. Finding Directions West: Readings That Locate and Dislocate Western Canada's Past. University of Calgary Press, 2017. Cruikshank, Julie. Do Glaciers Listen? : Local Knowledge, Colonial Encounters, and Social Imagination. 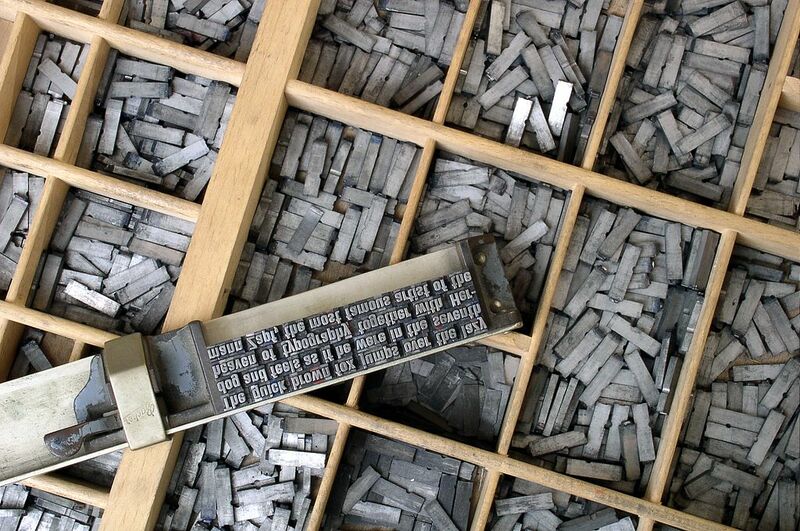 University of British Columbia Press. 2005. Dodge, Martin, et al. Rethinking Maps: New Frontiers in Cartographic Theory. Routledge, 2011. Fotiadis, Piers. “The Strange Power of Maps.” MSc thesis, University of Bristol, 2009. Siskind, Mariano. “Captain Cook and the Discovery of Antartica's Modern Specificity: Towards a Critique of Globalism.” Comparative Literature Studies, vol. 42, no. 1, 2005, pp. 1–23. Sobel, Dava. Longitude the True Story of a Lone Genius Who Solved the Greatest Scientific Problem of His Time. Harper Collins, 1996.